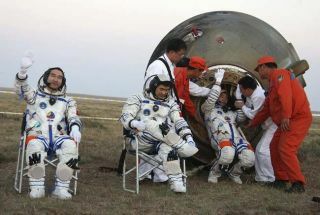 Chinese astronauts Zhai Zhigang, left waves near Liu Boming, center as Jing Haipeng is assisted out of the Shenzhou re-entry capsule after they landed on the plains of China's northwestern Inner Mongolia Autonomous Region, Sunday, Sept 28, 2008.Zhai conducted the country's first-ever spacewalk during the mission. In the wake of the sterling success of its third mannedspace mission, China is sitting proud and looking ahead to its future in space. Most experts agree the event, which included the nation's firstspacewalk, went off without a hitch. Before the Shenzhou 7 mission launchedSept. 25, Chinese space officials said there were four main objectives to themission: to conduct a spacewalk, to do tests of a solid lubricant materialduring the spacewalk, to deploy a new satellite to take images, and to use a newdata relay satellite for communication, said Dean Cheng, China analyst withAlexandria, Va.-based think tank CNA Corp.
"From all accounts, that happened," Cheng told SPACE.com. "If I were the Chinese, I would be very, very happy that all four taskscame off without a hitch. And obviously they used the spacesuit, so that cameup good across the board." While conducting the spacewalk, astronaut Zhai Zhigang worea new, Chinese-built spacesuit (called "Feitian," meaning "flythe sky" in Chinese). That it worked safely marks another significanttechnological achievement. Zhai, along with crewmates Liu Boming and JingHaipeng, returned to Earth on Sunday. Chinese premier Wen Jiabao pronounced Shenzhou7 "a victory of the Chinese space and technological field and amonumental achievement in the socialist causes," reported official statenews agency Xinhua. In another first for the Chinese space program, the majorevents, including launch, landing and the spacewalk, were broadcast live. Themove signals both China's growing confidence in its abilities, as well as a newwillingness to be open with the press and public. "The success of Shenzhou 7 certainly shows China's commitment to an ambitious manned space program," said Joan Johnson-Freese, an experton the Chinese space program at the U.S. Naval War College in Rhode Island. "Iapplaud not only their technical achievements but the confidence in theirprogram exhibited by their increasing transparency about the mission. I hopethat continues and expands into all areas of their space activities." Shenzhou 7 followed the 2005 Shenzhou 6 mission, which tooktwo astronauts to space for five days, and the 2003 Shenzhou 5 mission, whichlaunched China's first astronaut, Yang Liwei. With each new mission, China is taking steps toward its ultimate goalsof establishing a more permanent presence in space through building a spacelaboratory, and perhaps even landing on the moon. The latter goal has beenstated more explicitly after the recent success of Shenzhou 7. "We still do not have an exact timetable for a mannedmission to the moon, but I believe a Chinese (astronaut) will set foot on themoon in the not too distant future," an unnamed official told theCommunist Party newspaper the People's Daily after the mission landed. Wang Zhaoyao, spokesman for the manned space program, toldreporters Sunday that it is "necessary" for China to put a man on the moon, the Agence France-Presse news service reported. "We believe that as long as we can make furtherprogress in science and technology, we can achieve the dream of a manned spaceflight to the moon in the near future," he said. These firmer declarations of intent are significant, because China is unlikely to set a goal it doesn't believe it can accomplish. "When you just have speculation, they're under noobligation to try it," Cheng said in a phone interview. "But when theChinese make an official statement that they want to do something, they doit." While moon plans may be a bit off, China's next mission is likely to put the nation on the path to a space lab.? A date hasnot yet been set for Shenzhou 8 or 9, but there is a good chance the twomissions will be launched in close succession so they can try rendezvous anddocking, experts say. "China's next step will be clearer once a next launchdate is announced toward a docking," Johnson-Freese said. "Hopefullyit won't be another two years." There are also some speculations that Shenzhou 8 will carry China's firstfemale astronaut to space. There are currently no women in China's corps of 14 spaceflyers. However, some press reports hint that Shenzhou 8 and 9 may beunmanned missions intended to launch the capsules needed for a small space lab,and could go up in 2010. According to those reports, the next manned missionwould be Shenzhou 10.China also recently announced it was capable of trainingforeign astronauts, meaning that it could conceivably broker a deal withanother country to carry a person into space. The United States and Russia have both engaged in similar arrangements ? Russia flew the first South Korean astronaut intospace in April 2008, and the first Italian astronaut rode aboard the U.S. space shuttle Discovery in 2007, for example. "Given China's diplomatic use of space, there is a verygood chance they would be taking somebody from a new country," Cheng said. China has spearheaded the founding of the Asia-PacificSpace Cooperation Organization, a group intended to promote spacecooperation between Asian nations. Cheng pointed out that both Iran and Pakistan are members of the group, and could be potential clients for Chinese spacetransport. "I would strongly suspect that at this point in time the U.S. is probably unlikely to be taking any Iranian citizens into space,"Cheng said. "But China has had successful sales of satellitesto Nigeria and Venezuela, both of which are oil-producing countries, which wouldmake Iran a candidate as someone who might send an astronaut up." A foreign astronaut could even fly as early as Shenzhou 9,Cheng speculated.